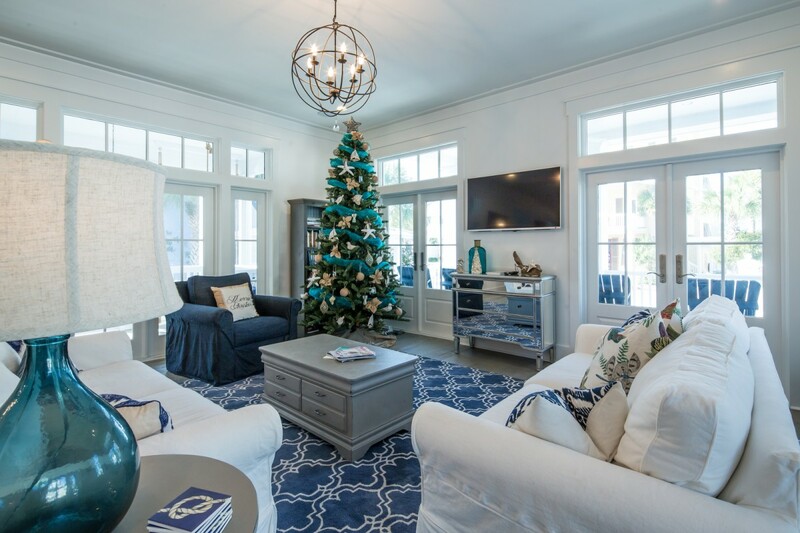 This house was built in Carillon Beach for a family out of Birmingham Alabama. They were looking for an investment property but could not find what they were looking for, with the limited lots on the market in Carillon Beach. So they chose a lot with an existing guest house and decided to build. It all worked out great! With a few interior and exterior improvements, they were able to put the guest house on the rental market and start earning some immediate cash on this investment! 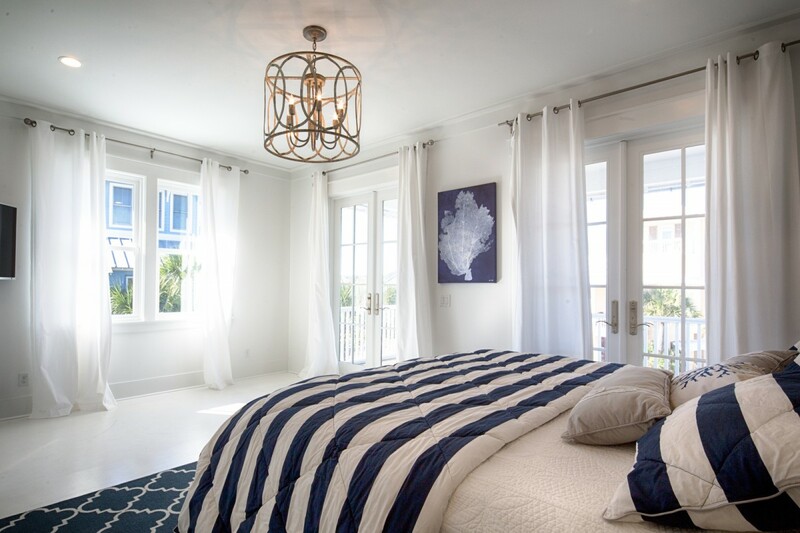 The owners’ wanted to maximizing the “sleepability” of the house, with the goal of putting it on the rental market, having more bedrooms means a higher daily rental price. The owner’s wish list also included exterior amenities, such as an outdoor fireplace and sitting area along with an outdoor kitchen and the challenge was to find a place to fit them all cohesively on site. The selected lot was a corner lot and had potential views of the gulf and Lake Carillon. Some creativity and careful placement was essential to maximize the views of the tower and upper porches. Not all vacationing families need or can afford both a main and guest house, so it was important to provide space for each house. This would allow the rental guests to enjoy the amenities without losing their privacy and relaxation of their vacation, while giving the owners the best potential income of a rental property. The owners were anxious to get the house on the rental market and take advantage of the busy summer season, so breaking ground in October of 2014 left only 8 months to complete the project and renovate the guest house. It was all finished by June, but the owners had to quickly get it set up and ready for the first reservation. The open floor plan on the first story is a great gathering place but building-wise, created long framing spans that required some extra engineering ingenuity. To maximize the views, the tower was placed in the center of the house, over heated and cooled area, and this required large beams that transversed the entire width of the building. This design left an open deck on the roof, over conditioned space. To make sure this area was completely waterproof, the carpenters built a dam and filled it with water and checked for any leaks. It was watertight! We also built a floating deck system on top so it can be pulled up every decade to check the waterproofing system. This two story house located on a corner lot is wood frame with double porch and a tower to capture views of the gulf and lake. It has ten foot ceilings with two master bedrooms, one up and one on the first floor, and two guest bedrooms and a bunkroom. 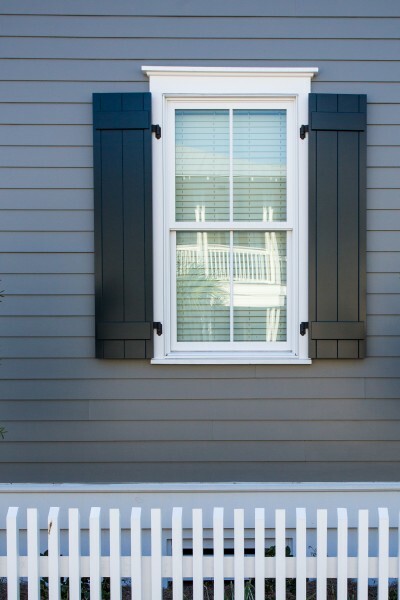 The exterior siding has Hardiboard planks on the first story and Hardiboard shingles on the rest of the exterior. The entry stairs to the front door, jets out from the house, as a grand welcoming gesture to visitors. As you open the front door, you immediately notice all of the antique wood touches in this great room of space, encompassing the living, dining and kitchen area. The owners found some beautiful salvaged flooring from the exterior siding off an old barn in Indiana. The wood was custom milled into six inch long lengths of flooring. Then it was finished by lightly sanding the wood with an orbital sander and then staining with grey antiquing and then three coats of flat polyurethane. The inset cabinets were custom built of solid maple with recessed panel doors. They were field painted to match the trim and make it easier for occasional touch ups, from the wear and tear of renters. The upper kitchen cabinets were made into shelves using antiqued wood blocks suspended from the ceiling with stainless steel all-tread nuts and washers. The backsplash reaches to the ceiling with subway tile, turning this highly visible wall into a statement piece, seen as soon as you entry the home. The powder bath is tucked behind the staircase by the walk in pantry area. It has a quaint custom built vanity table that features a sink and faucet that is reminiscence of an old farmhouse bathroom. 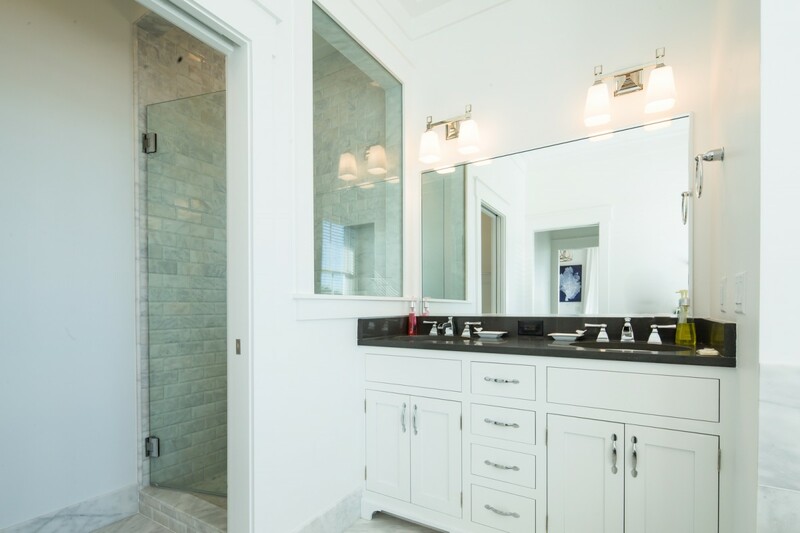 At the end of the hall, you will find the first master bedroom with a beautiful bathroom of double pedestal sinks and a soaking tub. 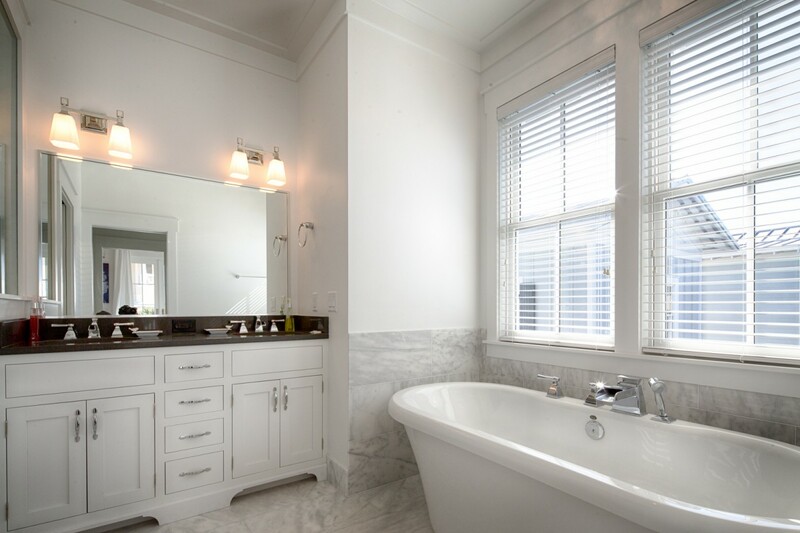 Many of the walls in the bath are covered in tile to keep the bathes easy to clean and maintenance free. The side porch is screened in and has a huge swing bed that was made by the owner’s father. 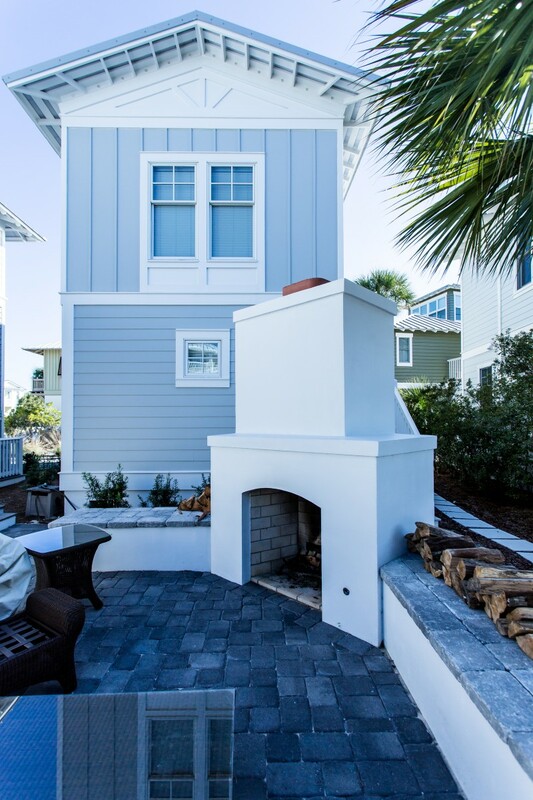 This side entry also has an enclosed outdoor shower and a built in nook in the sand/mud room to keep all the beach towels and accessories neatly and conveniently stored. 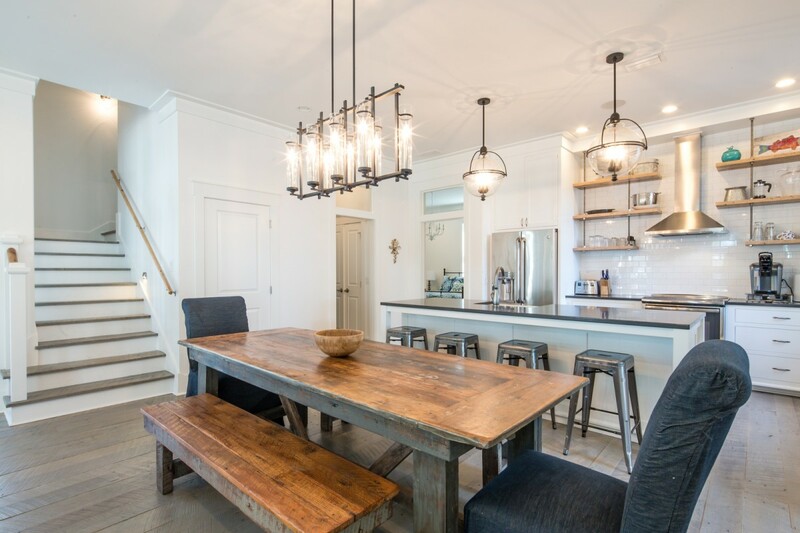 The staircase was custom built to match the salvaged wood flooring and we used square painted newels with one and a quarter balustrades, and built a three inch diameter antique oak cap rail with a natural finish. As you climb to the second floor you reach the hallway that captures the bunkroom and laundry area in a nice cozy spot under the stairs. The bunkbeds were site built by the carpenters. The hall also leads to the second story master suite and two other bedrooms and a hall bath. If you continue up the stairs to the tower, you will see the upper walls are flanked with windows and direct sunlight, which final open up to the outside tower porch. “I love the wood flooring and how the final finish turned out, but my favorite features is definitely the open tower looking over the gulf and lake. 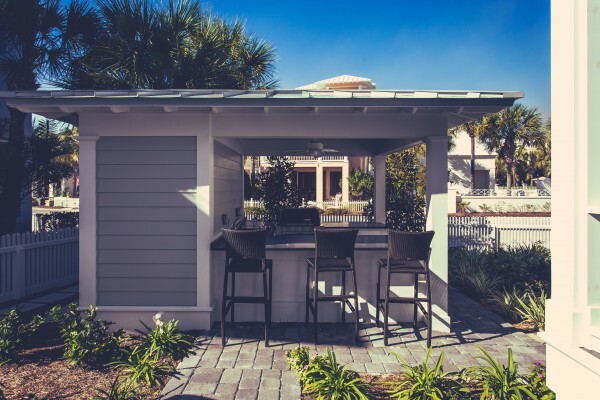 Most towers in Carillon are enclosed with windows and some offer a very small balcony that opens up to the outside, but this tower is probably the biggest tower in Carillon beach has the best layout with the wet-bar, porch decking and even some open air space to get some sun!